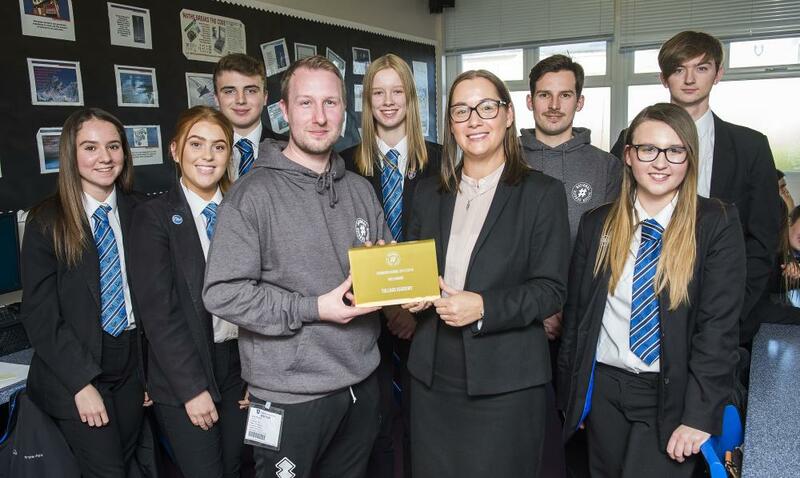 Adie Merrikin (centre) and Paul Thorpe (back), from Grimsby Town NCS, hand over the Gold Award to Tollbar Academy Principal Caroline Yates watched by students interested in NCS. They are (l-r) Eva Sutton, Kayleigh Smith, Oliver Halligan, Holly Moorcroft, Nathan Wilkinson and Jessica Duffield. Tollbar Academy has received a Champion School Gold Award from the National Citizen Service to celebrate the high numbers of its students who have taken part in the youth empowerment scheme. NCS is a programme which takes place outside of term time in the spring, summer and autumn holidays for 15-17 year olds. It is currently the fastest growing youth movement in the UK and offers a wealth of opportunities for young people. Adie Merrikin and Paul Thorpe, from Grimsby Town NCS, visited the Academy to present the award to staff and students. They also spoke to Year 11 students about the upcoming summer programme. Adie said: "This award has been presented to Tollbar Academy for the numbers of students it puts forward for NCS and for the great work the teachers do to help them. "Students take part in a residential programme where they complete team building activities and get out of their comfort zone by trying out new activities such as canoeing or abseiling. They choose life skills that they wish to develop. This could be something such as cooking, first aid or photography. The students carry out a community action project of their choice and, when they graduate, students are invited to a special celebration with their family where they receive a certificate signed by the Prime Minister. "NCS has a real impact on emotional growth, the students meet new people and learn to be more independent. They learn new skills and take part in many physical activities. They learn about aspects of physical health, as well as resilience." A number of students at Tollbar MAT Sixth Form College have taken part in NCS. Year 13 student Rhys Thomas said: "It was so enjoyable... especially building the Flintstones car. It was like PGL for adults! The charity work we did in the community was very rewarding. "Another big highlight were the lectures we took part in at the Institute, which were very enlightening as to how charities support people in our local communities and how we can all help." Caroline Yates, Principal of Tollbar Academy, said: "We are very happy to support NCS, which is a fantastic scheme for broadening the outlook for young people and teaching them a range of new skills outside of school. We are very proud to receive this award."